Not to be confused with ostium secundum or foramen ovale (skull). Sketch showing foramen ovale in a foetal heart. Red arrow shows blood from the inferior caval vein. HF: right atrium, VF: left atrium. 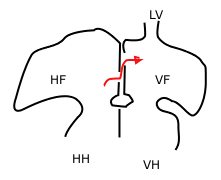 HH and VH: right and left ventricle. The heart still has a common pulmonary vein (LV), instead of four. Heart of human embryo of about thirty-five days, opened on left side. In the fetal heart, the foramen ovale (/fəˈreɪmən oʊˈvæli, -mɛn-, -ˈvɑː-, -ˈveɪ-/), also foramen Botalli, ostium secundum of Born or falx septi, allows blood to enter the left atrium from the right atrium. It is one of two fetal cardiac shunts, the other being the ductus arteriosus (which allows blood that still escapes to the right ventricle to bypass the pulmonary circulation). Another similar adaptation in the fetus is the ductus venosus. In most individuals, the foramen ovale closes at birth. It later forms the fossa ovalis. The foramen ovale forms in the late fourth week of gestation. Initially the atria are separated from one another by the septum primum except for a small opening in the septum, the ostium primum. As the septum primum grows, the ostium primum narrows and eventually closes. Before it does so, bloodflow from the inferior vena cava wears down a portion of the septum primum, forming the ostium secundum. Some embryologists postulate that the ostium secundum may be formed through programmed cell death. Normally this opening closes at birth. When the lungs become functional at birth, the pulmonary pressure decreases and the left atrial pressure exceeds that of the right. This forces the septum primum against the septum secundum, functionally closing the foramen ovale. In time the septa eventually fuse, leaving a remnant of the foramen ovale, the fossa ovalis. In about 25% of adults the foramen ovale does not close completely, but remains as a small patent foramen ovale ("PFO"). PFO has long been studied because of its demonstrated role in some cases of paradoxical embolism. After exclusion of more common causes of stroke and TIA, transesophageal echocardiography should be considered in order to exclude cardiogenic foci of embolism. The presence of a patent foramen ovale should be considered as a possible cause of the cerebrovascular event, even though it may simply be an occasional finding in patients with cryptogenic stroke. ↑ "foramen". Merriam-Webster Dictionary. Retrieved 2016-01-22. "ovale". Merriam-Webster Dictionary. Retrieved 2016-01-22. ↑ "foramen". Oxford Dictionaries. Oxford University Press. Retrieved 2016-01-22. ↑ "foramen". Dictionary.com Unabridged. Random House. Retrieved 2016-01-22. ↑ Sadler, Thomas W. (2004). Langman's Essential Medical Embryology. Lippincott Williams & Wilkins. ISBN 0-7817-5571-9. ↑ Homma, S. (2005). "Patent Foramen Ovale and Stroke". Circulation. 112 (7): 1063–1072. doi:10.1161/CIRCULATIONAHA.104.524371. ISSN 0009-7322. "Congenital Heart Disorders". Cleveland Clinic.